Hats and Rabbits: A New Kind of Intolerance? Here's a story that made me sad. If you don't have time to read it, let it suffice to say that a teenaged girl, Jessica Ahlquist, went to court against her school in order to have a banner removed from the wall -- a prayer that had been written by a former student of the school and that had hung on the wall in the place for forty-nine years -- and she won. Ahlquist is an atheist and she found the prayer offensive. Some have labeled this girl as "evil" and others have lauded her as a champion of the ideal of "separation of church and state" that is contained in the first amendment of the United States Constitution. Congress shall make no law respecting an establishment of religion, or prohibiting the free exercise thereof [my italics]; or abridging the freedom of speech, or of the press; or the right of the people peaceably to assemble, and to petition the government for a redress of grievances. Everyone seems to take what Thomas Jefferson once said in a letter -- something regarding that idea that a wall should be built between religion and governments -- and to apply it to this amendment. But the amendment seems to be much less severe. All it declares is that the government should not make laws regarding religions or that it not make laws that prohibit people from exercising their religious practices. Is there a lawyer out there who can explain this to me? 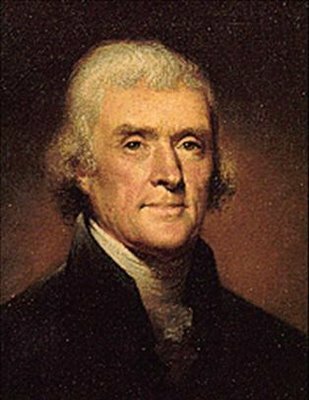 Am I to understand that Jefferson's letter is a binding legal document? Are there other established factors (or documents), of which I am not aware, that make it necessary for an institution with governmental ties to remain completely devoid of religious allusions -- or decorations? The young woman who raised the lawsuit against the school felt offended by the prayer. She said: “It seemed like it was saying, every time I saw it, ‘You don’t belong here.’” As an atheist, she was offended by a religious prayer. Okay. I get that. But it seems to me that there can be three reactions to that prayer's presence in the school: 1) "Who cares?" 2) "I don't think that should be there, but I have more important things to worry about, like learning and growing up" or (3) "I am offended by it, so I will lead a crusade to have it removed even though it currently and has been (for forty-nine years) beloved by many (if not most) members of my community." My other problem is that, for the life of me, I can't figure out how the first amendment disallows banners like the one in question; or, why, for instance, kids of various religions can't form a prayer group after school or during lunch or access periods; or why a moment of silence can't be given in the morning to allow kids to meditate, snooze or say a silent prayer to whatever god they believe in. (They tried that for about a month when I was in school, then someone complained. Admittedly, I was of the snoozing group, but I did like it and so did all of the other kids, from the ones who said the rosary to the ones who snoozed.) Are any laws being made against or regarding religion when a school allows kids to express their religious beliefs? And doesn't it sound, by taking down banners and not allowing kids a safe place to talk about their beliefs and even to pray, that it is closer to "prohibiting the free exercise, thereof"? I am a Catholic. I would not find it offensive if wise words of Buddah or Mohammad graced walls of my sons' public school alongside those of Jesus and, say, Ben Franklin. I would be proud of any student who wrote an inspiring prayer to a god in whom he believes, especially, as with the prayer in question, if it were one uttered for the intent of the entire school community. I say we plaster every school gym with prayers of a thousand religions. Let the kids sort it out for themselves. Maybe they will learn to tolerate the beliefs of others and to not turn the expression of those beliefs into personal affronts. We need heroes. It's true. I'll cheer for the Jewish kid or a Muslim kid who fights to get his prayer put up alongside the one written by the Catholic kid. That, to me, is a cause worth pursuing. That, to me, indicates progress in a country that should reflect tolerance and harmony among its religions. It seems to me, in applauding Jessica Ahlquist, we're flirting with a new kind of intolerance. Chris, this is brilliantly stated. Thanks, Bryan. I appreciate it. I am a Catholic. I would not find it offensive if wise words of Buddah or Mohammad graced walls of my sons' public school alongside those of Jesus and, say, Ben Franklin. Well said. There is no wall of separation of church and state, there is a low picket fence where the two talk to each other, and they each stay out of each others business. I accept the nom... Oh, wait. No, my schedule is full up in 2012. Ah, well. How do we know she is an atheist as she says she is and not, say, a member of a certain group practicing a little bit of cultural guerrilla warfare? That is entirely possible. What may be even more likely is that it is a (successful) bid for attention. Not that teenagers ever seek attention ... But you 're right: in a lot of ways, I doubt there is a real ethics-related motive behind her actions.